Tell me about the character you play in The Jungle? 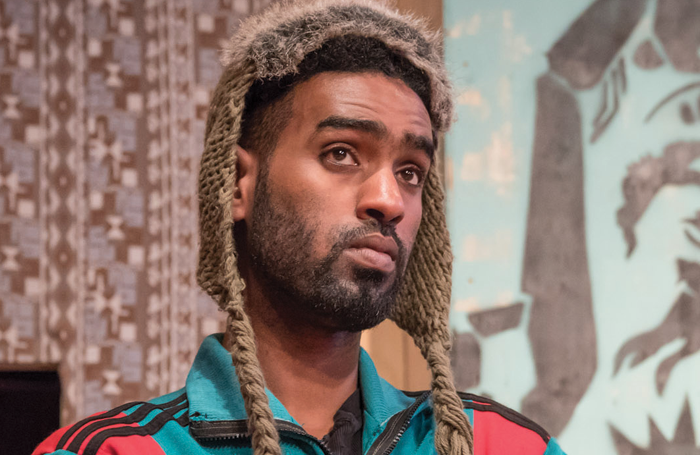 I play a Sudanese refugee called Omar. Things came naturally for me for the role – just from my own experiences. Sometimes in the play, I am just being myself. Why is it important to tell these stories in theatre? When I meet people after the play, they really like it. It is changing ideas about migrants and refugees. I have met some people who had no idea about refugees or Calais, people who have not been there at all. They ask me: “How was it in the Jungle?”, “How did you get there?” and “Why did you flee your country?” It’s important to do this play about these stories so that people who have not been in this situation can understand. How did you get involved in The Jungle? I got involved from the beginning. I stayed for a long time, for three weeks, in the Calais Jungle. I knew Joe [Robertson] and Joe [Murphy], the writers of the play, who I met in Calais when I was there. I used to go to the Good Chance Theatre [which was set up by the two Joes in the Jungle], where I would sing and drum. I used to go there every night. I also visited the Good Chance Theatre when it moved to Paris to lead some workshops there. Back home I used to do music – I like singing a lot. My father supported me when I was young, and I come from an artistic family – my uncle was a famous singer and dancer. I also love drumming, which I’ve done since I was a child. I became a professional and used to perform at wedding parties. Since coming to the UK, I have done two plays, one called Borderline and another called The Welcoming Party . I have not had any official acting training, but when I was a small child I sometimes did acting at school in a thing we had called Art Class, although I mainly did music and drumming. I’ve also done improvisation classes in London. When I started acting, I was not sure whether I was going to carry on, because I loved making music more. After doing these three plays, and The Jungle in the West End , I would love to carry on with this. I want to say thank you to The Jungle company for giving me the opportunity to be in this amazing play.